A leading distributor of human crossover medications for veterinary use managed storage and distribution of thousands of products from a small office at their headquarters location in Miami, FL. As their business grew, demands increased for labor and time that distracted the company from core marketing and sales operations. After extensive research and an RFP review, WDSrx, a pharmaceutical 3PL, was selected and developed the preferred solution to increase efficiency and allow the client company to concentrate on sales growth. WDSrx is a healthcare logistics service provider with 320,000 square feet of capacity at multiple facilities in Florida and Texas featuring ambient, refrigerated and frozen cold chain capabilities. Operations are licensed to meet cGMP, FDA, DEA, EPA, DOT, VAWD and Federal, State and Regulatory Agency requirements for handling of Over-The-Counter, Prescription and Controlled Substance (CII-CV) pharmaceutical products in secure vaults and cages. The client needed more space to accommodate their expanded product offering and increase efficiency. As a distributor of crossover medications serving thousands of veterinarians across the country, the client managed warehousing and fulfillment from their office in a space that the business had outgrown. 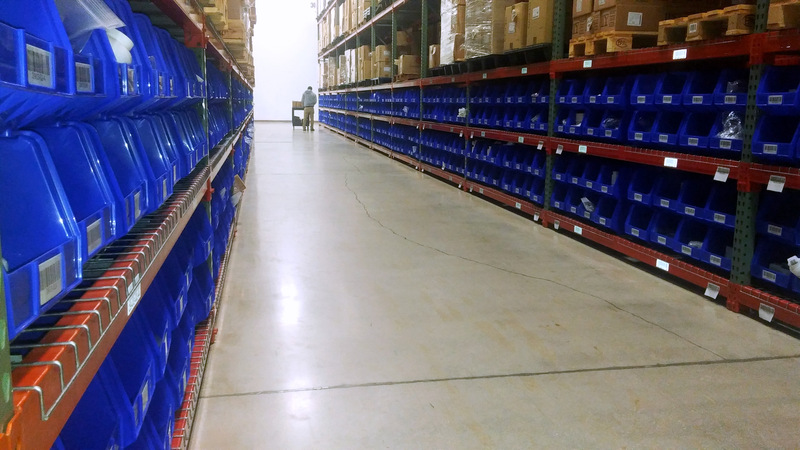 With over 1,200 SKUs and approximately 800 orders daily, a new dedicated space was necessary. Challenges had to be addressed by WDSrx as well. 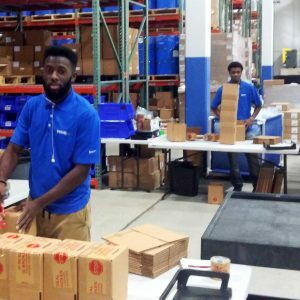 As a pharmaceutical logistics services provider, WDSrx primarily receives, stores and fulfills large orders on pallets for shipments to downstream trading partners including healthcare facilities, wholesalers and distributors. Transactions for this client consist exclusively of single or small multiple items packed and shipped directly to final dispensers. WDSrx developed a solution with this client that involved changing the configuration of warehouse shelving and adjusting work schedules to accommodate extended shipping deadlines. Normally, one shelving bay in a WDSrx warehouse accommodates two pallet positions. This solution required installation of new crossbeams and decking in twenty-five (25) bays. Each shelving bay was modified to hold thirty-two (32) bins each for a total of eight hundred (800) separate storage locations. The bins were placed along two sides of a center aisle to allow easy access to packing stations and shipping docks. Orders are picked, packed and shipped up to 7:30 p.m. for next morning delivery to destinations within the United States. The workflow process also changed for the warehouse team to meet client needs. Orders received electronically from this client are channeled by the WDSrx Account Manager directly to the floor where they are seen on handheld devices. Items are picked from their locations along the aisle and moved to the packing stations for packaging and labeling. Controlled Substances make up a portion of the client product assortment and were carefully considered as part of the overall solution. Controlled Substances are products with a potential for abuse falling in five Schedules or categories from Schedule 1 (CI) to Schedule 5 (CV) based on their addiction level. 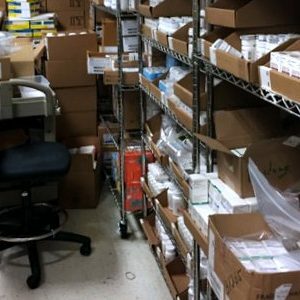 Orders for Controlled Substances are handled separately from other Amatheon orders because they are stored in secure vaults and cages in compliance with Federal DEA (Drug Enforcement Agency) regulations. First, the inventory is stored in a VAWD-accredited facility authorized by the DEA and FDA to handle pharmaceutical drug products including Controlled Substances in optimal conditions. The new location at WDSrx enables considerable room for expansion. Volume peaks at approximately 800 orders each day. Second, high shipping volume from the WDSrx facility results in preferential rates and services from courier companies. The deadline for overnight shipping from their original location was 4:45 p.m. and is now extended to 7:00 p.m. at the new warehouse. This change allows more selling time each day for orders to reach their destinations by the next morning. Additionally, a truck arrives daily and remains at the facility until 7:30 p.m. when it travels directly to the airport for loading and immediate departure. Finally, the new warehouse configuration allows more orders to be processed each day. As business increases, new equipment will be considered including conveyors and an automatic cartoner. These improvements result in cost savings for the client while increasing operational efficiencies. Pharmaceutical Warehousing and Distribution – WDSrx combines years of experience with a technologically advanced infrastructure for a sense of confidence and commitment that clients rely on and appreciate. Transportation Management – Patient welfare is a priority at WDSrx requiring the most efficient and safest supply chain solutions to deliver pharmaceutical drug products to their final destination. 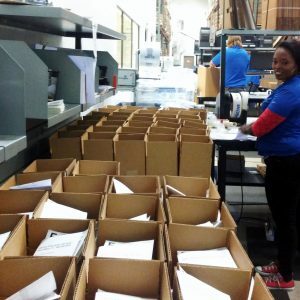 Product Packaging and Labeling – From individual items to full pallets and beyond, WDSrx places the correct product in the proper package for timely delivery to the designated location. DSCSA Compliance – Rules for receipt and shipping of pharmaceutical drug products are changing to require additional safeguards for increased patient security. For further information contact Larry Hotz, WDSrx Marketing Manager at (561) 998-3885 and at lhotz@wdsrx.com. WDSrx – Woodfield Distribution, LLC is a Logistics Services Provider (LSP) empowering the Life Sciences industry. WDSrx is a proud member of the Healthcare Distribution Alliance, Specialty Pharma Association, BioFlorida, BioHouston, BioNJ and NACDS.